BABBINGUR is one of the most invaluable things anyone can have in their lives. It is the Nyoongar word for ‘very loyal and devoted friendship,’ something a Wellard resident has discovered through his guide dog, Sundae. On June 22, Eric Seery and Sundae celebrated a major milestone together, graduating in a Babbingur Ceremony hosted by Guide Dogs WA. Mr Seery was introduced to Sundae in November. “From the start, I had a strong, positive feeling about Sundae, and her small size and exceptional skill at tucking under seats made the match even better,” he said. He was diagnosed with Stargardt’s Disease at just eight years old. “My vision loss was sudden and unexpected. One day in Year 3 I was able to read the blackboard from the back of the class, and the next day I couldn’t,” he said. He works at the Department of Mines and Petroleum in East Perth where his work mates have embraced their new ‘colleague’. “My colleagues love having her in the workplace -she brings light into everybody’s day. Sundae even has her own Dangerous Goods Officer ID badge!” he said. He said having Sundae had helped ease his anxiety along with being a good set of eyes. “Sundae has taken so much pressure off of me, which I held just to maintain my independence,” he said. He had advice for people who see guide dogs out in the public. “While she has her harness on, she’s hard at work,” he said. For more information, visit www.guidedogswa.com.au. 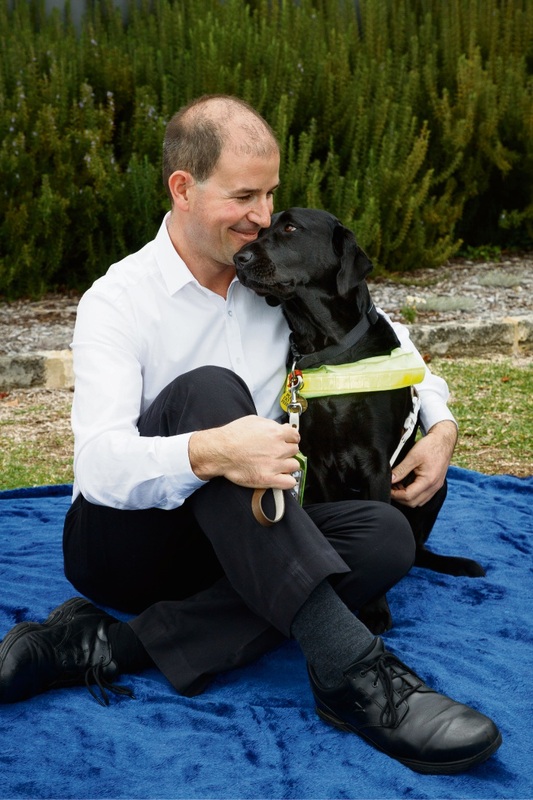 – It takes a minimum of two years and costs over $35,000 to train a Guide Dog, and Guide Dogs WA is reliant on the support of the community to fund the Guide Dog program. – More than 40,000 West Australians are blind or vision impaired, and this figure is expected to double by 2020. – To ensure fair access for all, our Guide Dogs are provided free of charge to a person who is blind or vision impaired. – Guide Dogs can go anywhere! By law, Guide Dogs are allowed access to everywhere their handler goes – and this includes Guide Dogs in training. It is an offence to refuse entry to a person accompanied by a Guide Dog or Guide Dog in training; the only exceptions to this rule are operating theatres and some areas of zoos (such as the walk-through exhibits). – It is important not to pat, feed or talk to a Guide Dog or Guide Dog in training, especially when they are in harness or their training coat. – Each dog is carefully assessed throughout their training and a career is chosen that best suits their skills, abilities and characteristics. Aside from a career as a Guide Dog, they may be chosen to be trained as an Autism Assistance Dog, or placed as a Companion Dog for children or adults with disability or Therapy Dog in a school, hospital or therapy setting. – In Western Australia, there are currently 53 working Guide Dogs, and 28 Guide Dogs in training.